Apple has said that it has no plans to converge MacOS and iOS, and will keep the two separate, but that doesn't mean that the two won't get much closer ties to work together. Today during the WWDC keynote, Craig Federighi announced how your Mac and iOS devices will work together, called Handoff. The service essentially makes all of your devices aware of each other when they are close together. In general terms, it means that you will be able to seamlessly transition from one device to another and continue what you were doing. 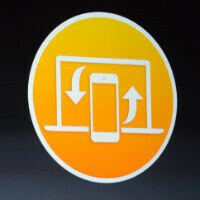 Of course, you'll have to be using Apple apps, but Handoff will bring "continuity" to the experience. Specifically, this means that you'll be able to start an email on any Apple device and pick up where you left off on any other Apple device. The feature will work with Apple Mail, messaging through iMessage, tab syncing through Safari, and it will even allow you to make and receive calls on your Mac, while the call is run through your iPhone as a relay. Handoff will also make it very easy to connect your Mac to an automatic hotspot created on your iPhone. Craig Federighi demoed the calling feature by calling Dr. Dre on his Mac, but the conversation was kind of awkward. You'll need to be running OS X Yosemite on your Mac (and theoretically iOS 8 on your iPhone) for this to work, both platforms are due out this fall. The Handoff service works through AirDrop, meaning it starts with Bluetooth to create a Wi-Fi peer-to-peer connection. We've seen a lot of these features in various ways from Google with Chrome tab syncing and Hangouts, so it's hard to say how Apple's Handoff is going to differentiate. Did anyone else notice how for continuity, they always mentioned the iPhone was charging somewhere??? Did they not pick up on that and maybe think they need a bigger battery??? every other phone maker is updating the battery life on their phone. in fact in android it's a war for the best battery. ios people are wall-huggers, they always remain near electricity plugs. Missing real innovation .... missing STEVE JOBS ....RIP. Same thing with all of the Windows services. This news is good for customers of Apple's devices and services just as it was good for Google customers and Microsoft customers. Sorry buccob, that you didn't get the "bigger picture". Google Docs and Office 365 have done this for quite some time, they are primarily used by several people to work collaboratively. Although this is a big thing in itself, it hasn't changed the way we work, since using those technologies full time requires a change to the work habits and the workflows used. On the other hand, Handoff (pun not intended) does not try to change the way you work, but rather HOW you work. Imagine in a near future, a C-level manager using a SAP dashboard at the office with a 32 inch display. He can see all the companies main statistics at glance and could easily pop out a transaction requesting some immediate action. Of course, if he goes to a meeting, he won't be able to continue that action. With "Continuity" he can. Once security and pairing are ironed out, we could start seeing full macs start appearing in conference rooms and conference halls. You just pair with the main system, using Bluetooth LE and this will be greater than Android Beam. do you think he's gonna read this entire paragraph? maybe he will, but anyways, we are android lovers here 99% of people here except for the site owners. #StopPreaching #NoOneCares. Guys, let's see the overall package on offer after the announcement instead of clamoring "no innovation" in every article today. Innovation isn't about never before seen features and cutting edge inventions, it's about how you improve a product and wrap it all up into a new package that gives you an improved experience on many fronts. The ultimate innovation is in user experience, not useless inventions, so let's see if they're able to deliver that in iOS 8 by the end of the announcement. all the stuff that have been announced are present in Google Services. They can go to h*ll. And in Microsoft services as well. I use Android, iOS, Windows Phone/Windows so it is good to see these features moving over to iOS. I prefer this combination of syncing services in the Windows ecosystem as I use Windows as my primary desktop, laptop and tablet OS at home and at work as well. It was nice to be home over the weekend and open Excel and see the Unused WYSE Devices document I worked on at work was automatically synced to my Dell Venue 8 Pro and also show up on my Lumia 1020. Or maybe Android can go to h*ll just what happened to the A and B releases when the iPhone was announced. Also I remember Samsung released a Watch. It was called something like Galaxy Gear. Not sure what happened to it after Android Wear appear. As you can see technology has a way of making fanboyz have to eat their words, preatty damn fast. Totally agree. Too many people just focus on the technologies themselves or in pieces. They neglected important things that actually required to make them useable in day to day life. Apple has always been focusing on user experience and it has proven to be right. Example,I have used Airdroid for so long. Airdroid has all the feature long time ago but while it has all the nice features, it is actually quite a pain to setup before being able to use them. Apple has done it in a lot simpler way. LOL. Been doing that with Gmail... on my PC, and my Android. It's nothing to brag about. But it still only works with Apple apps. Not so great for the rest of us. At least Apple is not trying to turns phones and tablets into laptops and Windows PCs into tablets like Microsoft is. The morons at Microsoft are ruining both Windows tablet and Windows PC because they cannot figure out that these are two different devices for what are primarily two different usage patterns.